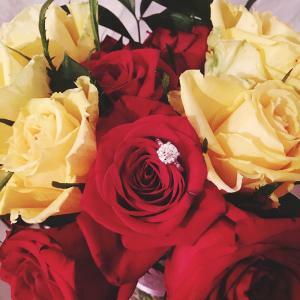 Firefighter themed weddings are a great way to honor a firefighter spouse as well as a fun way to demonstrate how hot your love is for one another. From accessories that reflect the firefighter to incorporating the red, yellow, and orange colors used by many departments, you can incorporate this theme into many aspects of your wedding. From basic color ideas to fun favors, there are different ways to incorporate a firefighter theme into your special day. While numerous colors are appropriate for a "hot" wedding, though the most popular hues are red, brown, white, orange, yellow, black, gray, and dress blue. The colors can be subtly incorporated in any number of decorations, such as the bridal party dresses, accent items, table linens, flowers, and more. 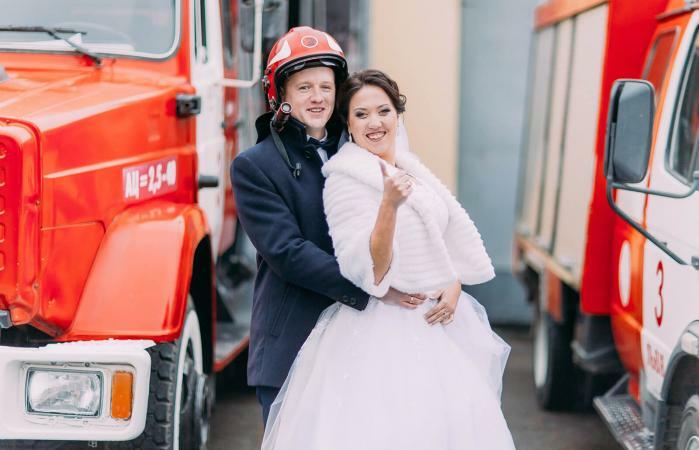 Classic attire is fine for a firefighter-themed wedding, though the bride may choose to have flame-like lace or rich red accents added to her gown. The groomsmen may wear colored shirts, ties, or vests, while the groom may wear dress blues if he is a firefighter. For a whimsical touch, the men in the bridal party could wear fire helmets or boots. A wedding's location is a key component of any theme, and weddings for firefighters can be elegant and classy in restored firehouses. Some firehouses can also rent banquet halls to interested couples. If these options are not available, couples can easily decorate any hall with firefighter-themed accents. To highlight the firefighter theme, choose wedding flowers in associated colors. Bouquets and centerpieces could be designed with long, thin blooms reminiscent of flames, or a firefighter boot could be used as a quirky vase. What better transportation to a firefighter celebration than a vintage fire truck? Specialty car rental companies may have one available, or a local fire station may be able to recommend private collections. 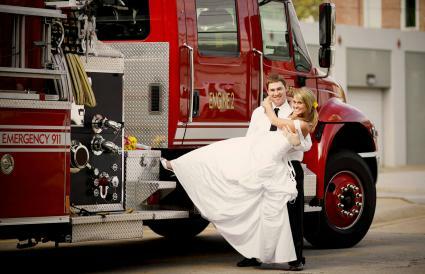 Some fire stations may even be willing to loan or rent active vehicles for wedding celebrations, particularly if the couple has a connection to the profession. If these options are not possible, couples could investigate renting a red limousine or other vintage or exotic car in a bright, fiery shade. Decorate with red and yellow accents, keeping the colors at the forefront. After the ceremony, ask your spouse's fellow firefighters to send you off memorably. 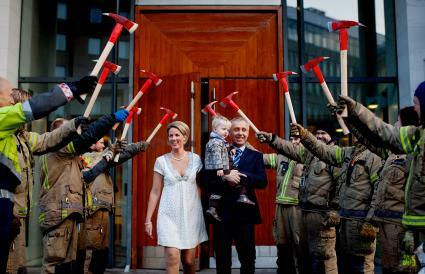 Have them line up and hold up their axes to create an archway as you exit the building. In addition to these fun and colorful options, couples may want to add a more sophisticated, solemn air to their event. A prayer for the safety of firefighters may be added to personal wedding vows, or the couple may light a candle for men lost in the line of duty. Plan out your reception with the theme in mind. Remember to incorporate small touches throughout the evening. The best way to decorate is to incorporate the colors and theme into your reception using both subtle and overt touches. Flame-kissed, spicy food is perfect for firefighter weddings. Menu options may include grilled steaks or fish, hot salsa and chips, or wood-fired pizza. An open grill is especially suitable if it is available. For winter weddings, the fire house chili staple might be appropriate. The wedding cake can also be coordinated with a firefighter theme. Red velvet cake has a vibrant crimson hue, or the cake could be decorated with colorful flames. 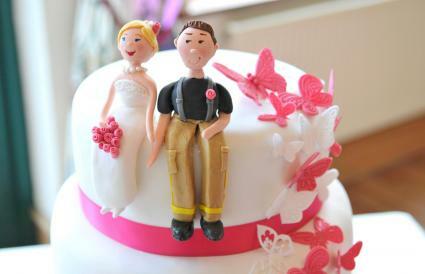 Firefighter wedding cake toppers featuring firefighters are not difficult to find, or a cake could simply use a hat or shield motif. For a daring couple, chipotle or hot cinnamon fillings can ignite the flavor of any cake. The groom's cake, too, can be decorated to match the theme. Specialty bakers can create cakes shaped like shields or fire trucks, or the groom could choose an ignitable dessert such as cherries jubilee to make the fire come to life. Couples can spark some fun at their wedding reception by choosing music with fiery themes. Songs such as Ring of Fire, Hot Hot Hot, Standing Outside the Fire, or Great Balls of Fire are energetic dance numbers sure to heat up the party. It is easy to go overboard with any wedding theme, and too much fire-oriented décor and theming can make a well-planned event go up in smoke. To avoid getting burned by an overdone theme, couples should choose just one or two coordinating elements to weave throughout their wedding decorations rather than inundate guests with too much imagery. Carefully chosen, well-coordinated accents will be more beautiful and memorable than overwhelming choices.